This client used Factory Grade® technology to commission a shielded power cable system, linking a substation with a generation plant. 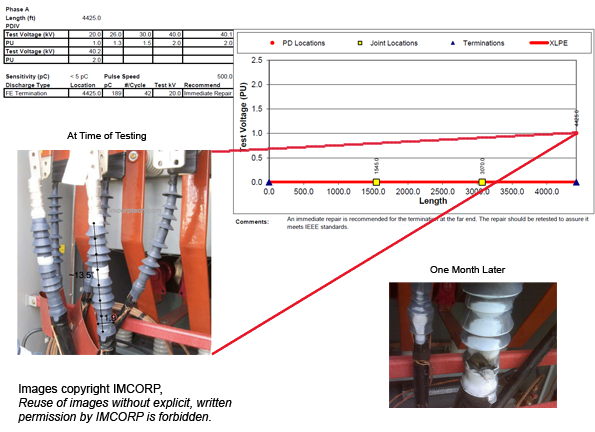 We found twelve cable terminations on the substation end of the circuits performing well below the manufacturers’ specifications. The contractor, being unfamiliar with the latest diagnostic technology and manufacturers’ standards, insisted that the terminations were installed correctly. In an effort to vouch for the quality of the system, the contractor performed an IEEE Type 1 VLF 0.1Hz Destructive AC HiPot on all of the cable systems in question. All cable systems passed the VLF AC HiPot. However, within one month there was a failure on one of the terminations recommended for repair by the Factory Grade® technology. Looking at the image above (One Month Later), you can see that the stress control was not in contact with the semicon. The plant owner then requested that the contractor repair all of the terminations reported as substandard by IMCORP.